A 70-year-old man on Long Island was killed in a house fire overnight. 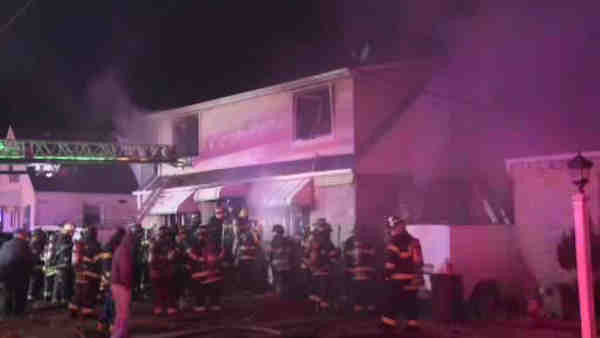 ELMONT, Long Island (WABC) -- A 70-year-old man on Long Island was killed in a house fire overnight. The Elmont Fire Department responded to Dutch Broadway around midnight. They found a 31-year-old man who escaped the fire but was unable to reach his father, 70, who was trapped in an upstairs bedroom. Firefighters reached the man, attempted CPR, then he was taken to the hospital where he later died. A firefighter from the Elmont Fire Department was taken to the hospital for treatment of minor burns to his upper legs. The son was suffered from minor smoke inhalation. The cause of the fire is under investigation. It is not considered suspicious.